We guarantee that all repairs undertaken by us will be free of defects in materials and workmanship for the lifetime of the device, starting on the date of return of the Equipment to you only on the part installed after completion of the Repairs Services. If the repair carried out becomes defective within the lifetime coverage after returning the device to you, we will repair only the item installed without cost. The Lifetime Guarantee only applies to the original owner of the device and is non transferable. We will not refund or repair without cost, any device brought to us after it doesn't function based on manufacturer's specifications. 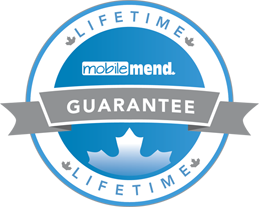 Lifetime Guarantee will be voided if there are any signs of supplemental damages to repaired device. There are exceptions to our lifetime guarantee which are the following all consumable products like batteries will only will guaranteed for 30 days and all soldering work done on the device will be valid for 90 days from the date of return. Further information contact any mobilemend location. Where your Equipment contains a SIM card, memory card or other accessories (together, the "Accessories"), you should keep hold of such Accessories during the provision of the Repairs Service and we cannot be held liable for any damage or loss to such accessories that you have failed to keep hold of. You acknowledge that we may have to reset the manufacturer's factory/default settings for your Equipment in order to carry out the Service. This might delete any data or settings held on your Equipment. Where relevant, and unless you have signed up to any back-up service that may have been made available to you, you must make sure that you back up any important data (including but not limited to any ring tones, music, pictures, logos, contacts, documents, emails, MMS, SMS, games and software) stored on your Equipment prior to the commencement of the Repairs Services as data may be lost during the provision of the Repairs Services and we cannot accept any responsibility for such loss. In the case of a mobile phone which has been unlocked for use on all networks, the resetting of the manufacturer's factory/default settings may result in the mobile phone being returned to a locked status. You hereby agree that you will be responsible for any fees payable to your network operator to subsequently unlock the mobile phone. All new hardware is under a 1 year manufacturer’s warranty.